Whether you’re looking to optimise your checkout, lead capture, or onboarding forms the 10 strategies below will help drive a high percentage of people through your forms. Before we jump into these 10 tips it’s important to understand how your visitors’ expectations and experience impact their likelihood of completing your form. While most advice on form optimisation focuses on improving form usability and ease, this is only the tip of the iceberg. 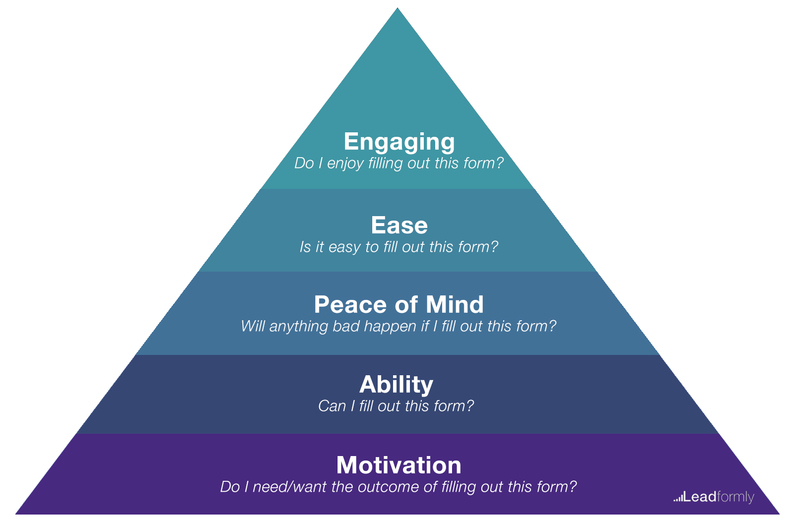 As illustrated in Leadformly’s Form Optimisation Pyramid, there are five elements that influence how likely someone is to complete your form. Now imagine I offered you a Ferrari for completing the same form. Suddenly, you’re far more likely to complete the form, despite nothing changing on the actual form itself. The thing that changed was your motivation. Motivation is the foundation of building a high-converting form. Without it, any usability or design-oriented efforts will be wasted. Your form optimisation strategy should start here and then work through the four remaining stages of the pyramid. With that in mind, here are ten strategies for decreasing form abandonment. When in doubt, simplify your forms. There are two very straight-forward ways to do this. The first is to delete all unnecessary fields and distractions. Asking for a password confirmation? Less than 1% of your visitors will type their password incorrectly, so consider a better approach like masking/unmasking the password field. Asking for their country? Consider capturing this from their IP address and setting it as the default selected option. The second way to simplify your forms is by using logic to ask different questions to different people. If your visitors/leads are a mixture of different groups of people, there may be certain questions that are not relevant or required for everyone. Using conditional logic to remove questions based on previous answers allows you to shorten the length of your forms without compromising the data quality. For the majority of websites, mobile and tablet traffic represents a major segment. Ignoring this in your form design is effectively like burning money. Given the nature of how we use mobile devices, you need to go beyond making your forms responsive and passing Google’s mobile friendliness test. Your forms probably need to be shorter on mobile, and potentially use more tap-based UI elements such as checkboxes and dropdown menus. Similarly, there’s nothing worse than losing leads or customers due to poor cross-browser testing. When we buy things online or signup to lists it’s natural to get a little bit anxious. Whether consciously or not, we often wonder whether there are bad consequences around the corner. Will I be spammed? Will my email list be sold? Will I regret this purchase? Will my credit card number get stolen or hacked from this site? 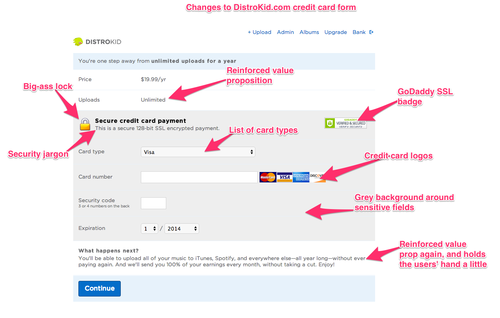 Distrokid, a music distribution service for artists, found that emphasising their value proposition and adding trust signals to their checkout form increased conversions by 60%. Your visitors are likely to have their own unique cocktail of anxiety-inducing questions running through their mind. Survey your users to understand these concerns, and then address them directly on your forms. It’s a common practice to include some variation of ‘no-spam guarantee’ on your forms. Are there words or images in your form that may consciously or subconsciously be deterring people from completing your form? 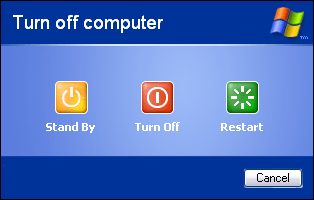 I’m told that when Microsoft changed their shut down screen from a one-click button to a dropdown menu, a large percentage of users stopped shutting their computers down as often. This is because a dropdown menu requires three clicks (open the menu, make the selection, confirm the selection) as opposed to the clickable button approach which only required one click. While not the be all and end all, thinking in terms of ‘minimum required clicks’ can help you to find simpler form elements to reduce clicks, and ultimately reduce the time and cognitive load required to complete your form. Validation rules are often used to tell users when they’ve missed a field or entered information incorrectly. Generally, validation rules are frustrating. I’m sure you’ve used forms in the past where the validation rules make it seemingly impossible to complete. Validation rules can, however, be useful and appreciated by the user. The best practice is to display inline validation that provides real-time feedback to the user, rather than waiting until the user clicks submit. Design is perhaps the single most important factor when it comes to building high-converting forms. Design impacts trust, first impressions, ease of completion, and even the motivation to fill out the form. In other words, when you improve design, you improve virtually all of the aspects in the Form Optimisation Pyramid above. For great examples of form designs, I’d recommend searching for forms on Dribbble. We live in a face-paced world, and even a few extra seconds that a webpage can take to load could lose you leads and sign-ups. For more tips on improving page, check out our post on ‘How to Improve Your Page Load Speed by 70.39% in 45 Minutes‘. If you asked 100 people whether they enjoy filling out forms, you’ll likely hear 100 resounding no’s. People fundamentally don’t enjoy filling out forms because they stand between people and the things they want. Filling out forms is a bit like going through customs in an airport – an undesirable necessity that you must do to get your desired outcome (travelling to a new country). As a marketer or product designer it’s your job to minimise the exposure to forms, or to make them more enjoyable. One way to do this is to make your forms unlike a form. Instead of text fields and dropdown boxes, you could experiment with an lead capture form that feels more quiz-like, using toggles, sliders, and more engaging elements. While this may sound counterintuitive and against UX common wisdom, I have plenty of data to back up the effectiveness of this approach. In fact, this is one of the principles that we’ve found make Leadformly’s lead forms so effective. 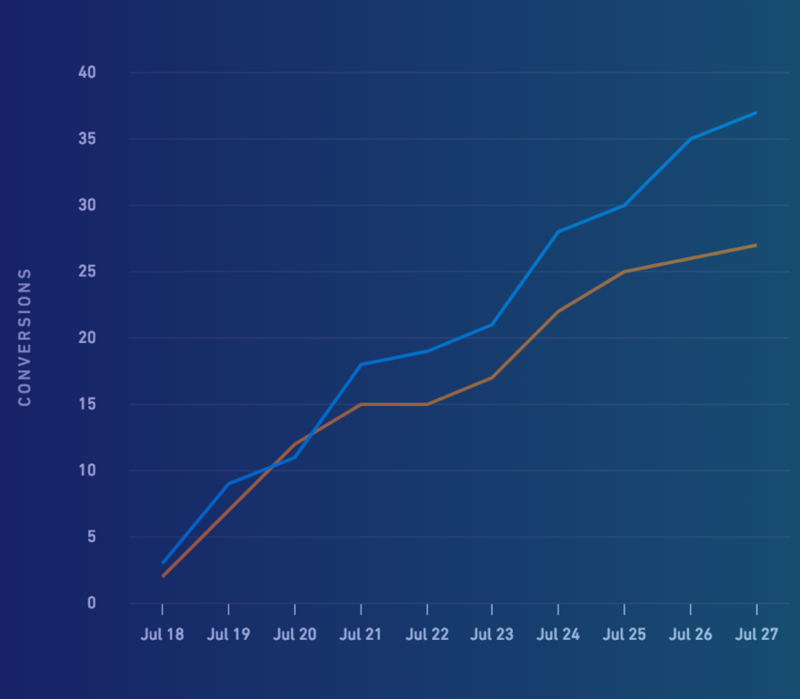 In one of my favourite case studies, we increased BrokerNotes’ lead capture conversion rate from 13.6% to 41.6% (more than tripling inbound leads) by using a more quiz-like lead capture form. 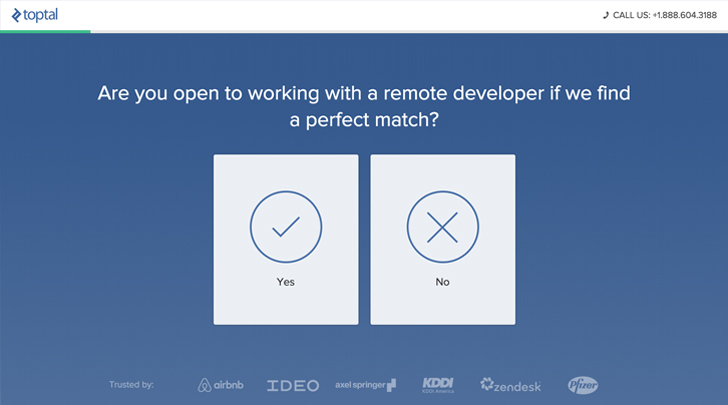 The TopTal onboarding form is another great example of an engaging quiz-like lead generation form. Want to see more examples? 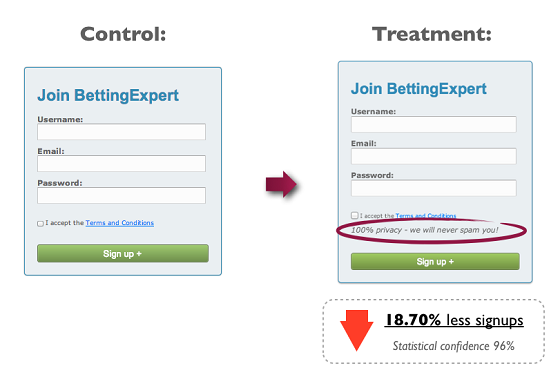 We shared 12 examples of high-converting lead generation forms here. Form abandonment implies that a user started filling out your form. This means that they must want whatever is on the other side of your form, whether that’s a free consultation, joining a community, or ordering a product. The problem is that they don’t want it enough that they’re willing to resist whatever distracted them, or to to overcome whatever hurdles caused them to drop out of your form. 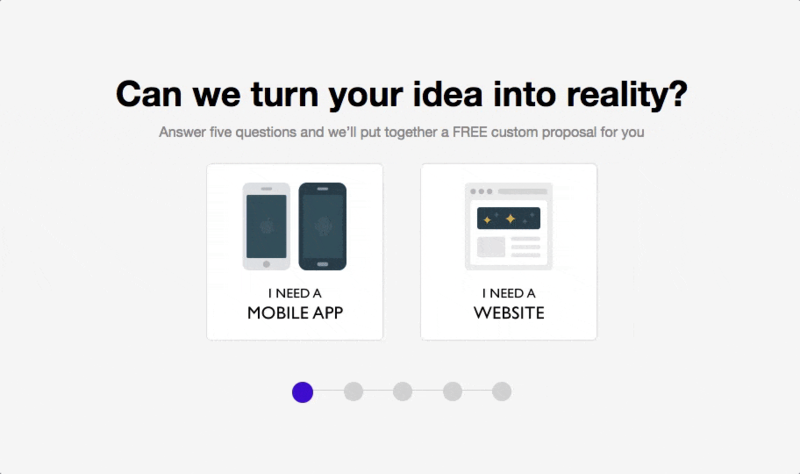 Sometimes the solution is simple – remind users why they’re filling out your form. Tell them about the difference their donation is making, or how their life will improve with your product, or how your service will help them achieve their goals. This booster shot of motivation may be all that’s needed to reduce your form abandonment. It’s uncertain whether it was said by the legendary management consultant Peter Drucker, or by the statistician William Edwards Deming, but either way the quote ‘what gets measured gets managed’ rings true. I recommend setting up a dashboard with daily statistics on form completion, along with a breakdown of which fields or questions have the highest drop-offs. This will give you a great feedback loop to identify what’s causing your form funnel to leak. When you know precisely what needs fixing, you can begin to hypothesise variations using the tips above, and then run an A/B test to boost your form completion and conversion rates. Remember – when you decrease form abandonment this has a huge knock-on effect across all of your marketing KPIs. Your cost per acquisition will go down, your paid ads will have a higher return on ad spend, and your overall ROI will improve. I hope the tips above are useful, and I wish you good luck in driving your form conversion rates through the roof!